BANGALORE, 22nd DECEMBER,2017 – IDC Financial Insights has released its perspective on payment industry in India titled The Future of Payments in India: More Spectacular Growth Ahead, that highlights the key trends in the digital payment space and their impact on the payment industry. This report shows the spectacular growth of noncash, digital payments in the once hard-to-crack market. This IDC Financial Insights report discusses the key changes and initiatives, both financial and non-financials, in the consumer behaviour and business economics that compel banks to relook into their strategy in digital payment space. Next-generation payment structures, such as mobile wallets, payments banks, BharatQR, and electronic authentication, have created new forms of digital payment channels and servicing capabilities. “The payment industry in India is clearly going through gigantic changes. Over the last few years, the tremendous growth in the digital payment space has elicited a passionate debate across the industry, but one thing is certain, the next several years will see a transformation of how consumers, businesses, and the government move money," says Anuj Agrawal, Senior Research Manager, IDC Financial Insights. 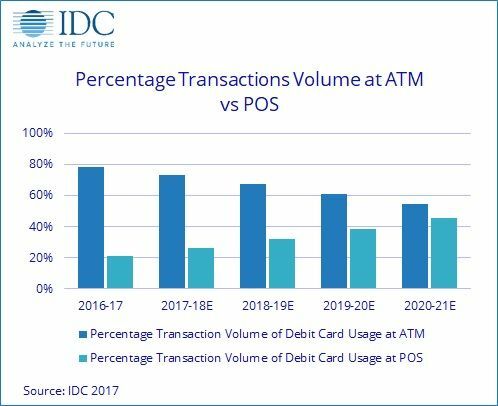 As was highlighted in IDC FutureScape: Worldwide Payment Strategies 2016 Predictions —APEJ Implications (IDC #AP40587415, January 2016), by 2018, several markets worldwide will launch a nationwide mobile payment scheme for POS, ecommerce, and ATM transactions, the report discusses how India appears to be steadfast in this goal, taking major steps to be among the first few countries to launch a nationwide mobile payment scheme. 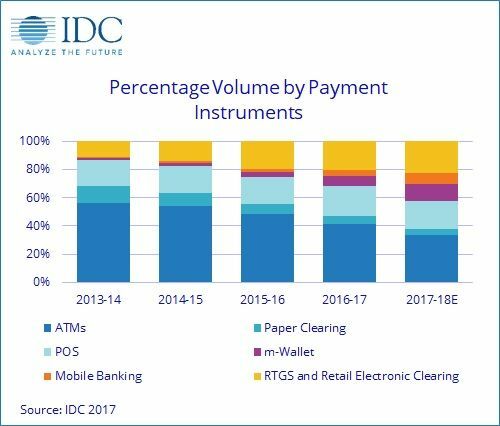 Usage (number of transactions) of digital payment instruments has seen a tremendous improvement year over year versus traditional nondigital channels (excluding cash). The contribution of digital payment instruments (such as retail electronic clearing, mWallet, and mobile banking) means the volume of transactions has already doubled in 2016–17 and is expected to grow further by the end of FY17–18, from 32 percent in 2013–14 to 62 percent in 2017–18 (estimate) (see Figure below).